With Valentine’s Day around the corner, you may be looking forward to a box of decadent chocolates and a fancy, gourmet dinner. But what if Cupid swapped your sweet treats for some better-for-you alternatives? It can be hard to rein in your sweet tooth when you’re ready to splurge, but making better choices every day can help lead to a happier heart. And all of us want to live a longer, healthier life with our loved ones, right? Finding alternatives to candy and a high-calorie meal shouldn’t be too hard. Just consider these fun swaps for your loved ones. Use a cookie cutter to make heart-shaped pancakes or waffles topped with fresh, red raspberries and strawberries instead of syrup. Create an all-red fruit and veggie platter with raspberries, red apples, red grapes, red peppers, strawberries and watermelon. Surprise your sweetheart with red and pink flowers. Make a heart-shaped veggie pizza. Serve strawberry sorbet in a heart-shaped bowl. Dip red berries in a small amount of dark chocolate and place them in a heart-shaped box. Give the gift of exercising together by joining a gym, taking a walk in the park or signing up for dance lessons. Choose activities you both enjoy that get you moving! What creative ideas can you think of? Every effort counts when it comes to happy hearts! Exercise and eating well can help control your blood pressure, cholesterol and weight. And with February being American Heart Month, there’s no better time than now to take heart and make some changes. Consider making a tasty home-cooked meal on the 14th. A great place to start your meal planning is at www.publix.com. Look for Aprons recipes — like these — designated “Heart Smart,” as they meet specific criteria based on guidelines from the American Heart Association. 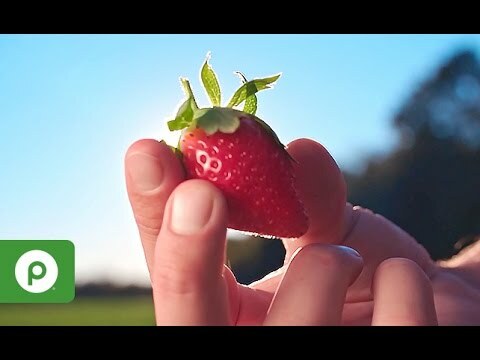 Strawberries are At Season’s Peak in this month’s Publix News Live. Satisfy your senses for this sweet berry by tuning in!